They say the grass is always greener on the other side, and this saying especially rings true when you're chasing the dragon for the next "big new thing!" We live in New York City, arguably the greatest city in the world, surrounded by youth, talent & artisanship. But even amongst this crowd, we always wonder what's happening in other places. 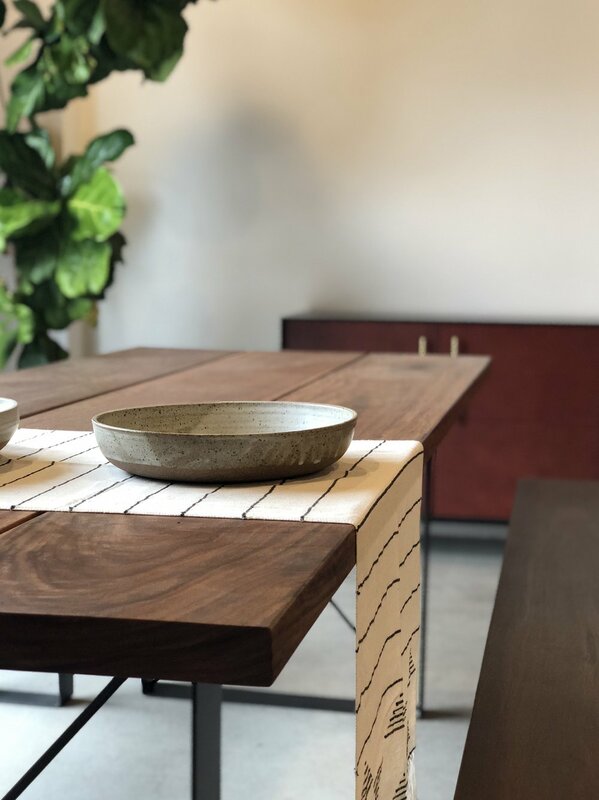 Design is heavily influenced by lifestyle, environment & culture, so in order to create visionary spaces we need to travel, collaborate & be amongst nature to produce exceptional results. To get the most out of a short trip, it's always smart to plan ahead (I know, I'm the queen of planning) but for reals, let's talk specifics here... hone in on your style, think about what you're looking to achieve and anything you may want to do differently, keep in mind your client's lifestyle (or maybe your own! ), think carefully about the environment in which the pieces you're on the hunt for will live in their forever home & what their longevity will be, but most importantly, think about objects & all the things that may create a new vibe and story for a space. I'm going to walk you through (as efficiently as possible) what I did in order to make the most out of our 4 day LA sourcing trip. From finding the vendors to creating the roadmaps and floor plans, defining your color palettes for each space and structuring timelines so you're prepared to negotiate and make things happen in an expedited fashion is of the utmost importance. 1- Honing in on your style - This one is the most important to me. As our little business continues to grow, more folks come to us for our particular style and vision. It’s important to me to find like minded partners who have cutting edge product within my aesthetic that will bring my vision to life and make it the best iteration it can be. I combed my gram for pictures I've saved (categorically) and vendors that shared the content. I'm all about black, grey, walnut, teak, and hints of green. These were the folks I set to meet first and foremost. 2) What am I looking to achieve & do differently? The #1 goal is always to find special items that hit the mark for our clients. I create floor plans in advance of any source trip and pre-plot pieces based on sizing that I know will work geometrically. I set a goal to hunt for something special (if I can find it) for each space that folks wouldn't have thought of or even have known about. Whether it's a light fixture, a layered rug, a piece of art or anything in-between, I figure out what wall, corner or ceiling would make the most sense for injecting this differential in advance of the hunt. The more you know about the space you're working with, the easier the sourcing is! 3) Lifestyle & Environment - Always know who & where you're shopping for. If you have a client (or yourself) who loves black, don't look for white (unless it's something you know they'd absolutely love + hits the mark, but you'll have to push them outside their comfort zone, something I do ALL.THE.TIME.) If you have a client with a child, look for fabrics that are bulletproof and furniture that won't hurt anyone (this one is much harder said than done, and I haven't hit the mark 100% of the time here because I don't have a child and think you can train them not to do things... but the reality is, you can try but without guarantees. Accidents happen all the time!) Don't be afraid to use indoor-outdoor fabrics for your sofas and chairs, which are extremely durable. I love a good perennials fabric or sunbrella option for the win! All of the fabrics shown above are perennials! Can you believe it?! Gorgeous, I know. We discovered those at Formations. I've also found that viscose or ultra-seude are great options for kids & pets! Holly Hunt has an incredible assortment of fabrics in these compositions and I rely on them for a lot of my upholstery, but that's not to say I didn't find some awesome new fabrics during my hunt! 4) Objects, Furniture & All the Things - It's important to listen to your clients (or your inner child/self.) Listen to where they like to travel, what they like to do on their travels, what organizations they support, where they like to eat in the city and who they spend most of their time with. These are all opportunities to tap outside "the friend zone" and procure really special items that tell a story with intention, paralleled with their way of thinking and doing. We had a few clients who shared they really wanted to alter their purchasing behavior in advance of our LA Trip. They wanted to see pieces that would hold the test of time aesthetically, but that were also FSC certified, sustainably grown and harvested. The idea of using fabrics that are eco-textiles vs. engineered was something we heard a lot of and are making it our mission to push into our company ethos, so this was top of mind. There are SO many beautiful options and if we can help the environment while we're making the world a more beautiful place, sign us up! We're seeing more and more folks interested in the narrative and origin of where their goods come from, which thrills us because not only are we shifting how we work, but we're shifting how others think. A must see pop up. They define vintage collective. The assortment is vast but thoughtfully curated to compliment newer elements. They have a beautifully merchandised showroom with an outdoor space that is peaceful, quiet and gets just the right amount of sunlight. They also have the cutest pup in all the land holding the fort down. His name is Eddie and you can't miss him! The most breathtaking showroom we walked through. The ceilings were easily 20'+ with skylights positioned every few feet, unreal steel doors (also 20'+) which all opened into gardens that could easily serve as a meditation sanctuary. 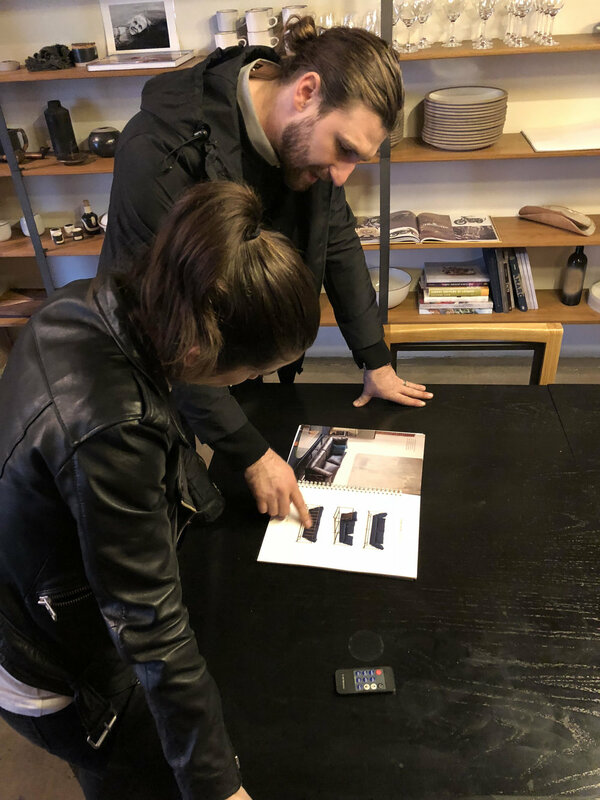 The careful selection of one of a kind product throughout the showroom was injected in all the right nooks & crannies to give you a treasure hunt feel. Guys, they had a coy pond at the entry, I mean... that just takes things to a whole new level. These guys freaking rock. Since meeting them, I've placed 3 orders and I'm not stopping anytime soon! The space is inside a well-lit, beautiful loft. Exposed joists, concrete floors and carefully curated vignettes to give you the lifestyle component of shopping for the home. They use sustainably grown/harvested woods for all their furniture, and several of their fabrics are eco-conscience. Everything is also locally sourced (material wise) and locally fabricated in the heart of DTLA. These guys are what we call distinguished sophistication. Every single drawer, door, cabinet had something special. They use earthquake proof mechanics so nothing inside your cabinets shake. While I know this isn't a need on the east coast, it's definitely a definable highlight since we're starting to pick up business on the west coast. This guy is legit the coolest. From his welcoming, loving personality to his unbelievable collection inside his HOME! Stephen has a way of making you feel like you're not just buying a piece of furniture, you're collecting a moment in history. Most of his pieces use WW2 Military upholstery fabrics, and vintage military hardware. Everything is made in LA, with love. No joke, you can feel it when you sit or place your cup down on a piece of furniture. We were beside ourselves when we found out he runs the BDCC (Back Door Coffee/Cocktail/Cinema Club). He and his amazing wife have come up with a way to bring community and conversation to his space every month. An amazing husband and wife team in the heart of DTLA. These guys have an unreal collection of hand picked objects and furniture, vintage and new. By the way these guys are incredibly thoughtful and organized in how they run their operation. We just placed our first order with them and could not be happier with the communication process. They have everything from beds to Japanese waffle towels and really dope speakers that don't look like speakers. We stumbled into this tiny showroom on Melrose. It has so much to offer! Elizabeth has her own farm in Kansas with tons and tons of adorable sheep! She uses the wool from her own sheep for her reserve collection. It’s a small assortment due to sustainability, which we can appreciate. These guys are simply the best. Their showroom and website are absolutely beautiful. Their motto makes you feel wholesome “wherever i lay my rug, that’s my home.” I work with them in NYC but couldn’t help but check out their LA digs. The attention and care to detail is unsurpassed. They have an amazing array of product. From Kilim’s, to vintage Turkish, flat weaves, Mongolian cashmere and alpaca boucle. We placed 2 orders with them since our LA trip and it doesn’t look like it’ll be slowing down. I’ve always been a huge fan of their minimalist clothing aesthetic. When we saw they had a furniture line in advance of our trip, we immediately booked an appointment and boy are we happy we did. J.P is quintessential California cool. His clean lines and tailored color palette definitely falls in line with our personal aesthetic. This was one of those places we checked out to hone in on our style. Plus, we have a lot of outdoor projects in 2018 and these guys are an authority when it comes to outdoor furnishings.